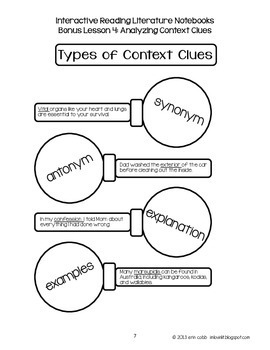 This freebie includes a complete interactive reading notebook lesson on finding context clues. It is a bonus lesson that is not included in my other notebook products, so be sure to download this if you own those as well. 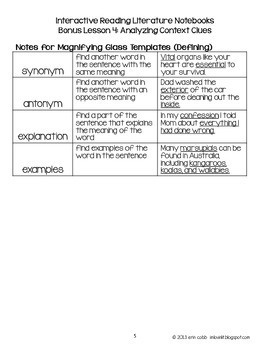 This lesson includes 3 activities and is aligned to CCSS standards for grades 4-8. You will find that this lesson contains the right amount of rigor to challenge your upper elementary and middle students. 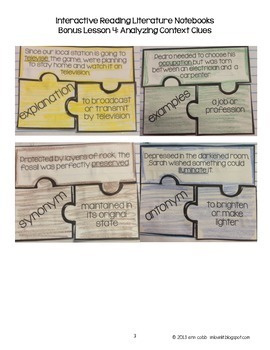 Instead of simply figuring out word meanings, your students will have to determine which type of context clue is used in each example. 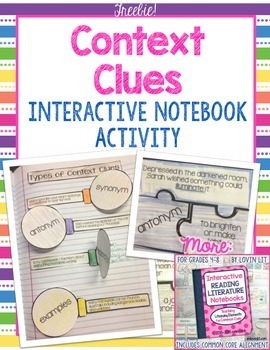 Are you thinking about using interactive notebooks in your reading classroom? I've also included at the end of this freebie a 3-page Getting Started Guide / FAQ for interactive notebooking. If you are considering one of my other notebook products, this freebie will show you exactly the type and style of content and thoroughness you can expect with my lessons.